This iconic Seinfeld show had many memorable moments. When I channel hop, I will often see re-runs and will stop and watch. These are classics. We have gone through many dietary phases over the years. All were helpful on the journey to healing my son’s numerous issues. We went from eating what could be considered as junk food to strict avoidance. After healing occurred, we opened up to typical foods. This blog chronicles the dietary journey and lessons learned over 13 years. It first started at the beginning of my autism journey. in 1998, but I did not begin with the “diet” until early 2000. In retrospect, I wish I had started this process sooner. At the time, my son only ate five foods: a specific fast food provider’s chicken nuggets, a half gallon of milk every day, Tiger’s Milk protein bars, peanut butter and jelly sandwiches on white bread and french fries. Nothing else! His daily diet was not nutritionally sound. I had nothing to lose in trying to adjust his diet; I had my son’s health to gain. Both my husband and I started off completely clueless. What was gluten? What was casein? Was soy an issue too? Based on standard medical labs, Jeff had 42 food allergies and a myriad of health concerns including serious gastrointestinal issues. This is not uncommon when it comes to autism. Even the American Academy of Pediatrics now agrees (1.) I know! Shocking! I remember two distinct issues in the beginning of this dietary process. It was hard to determine where was the gluten in a loaf of bread. I also remember when gluten and casein free foods back then tasted horrible and crumbled at the first bite. I am happy to report – that has changed for the better. Thankfully, I had great help from friends Mary and Poita who mentored me along the way. They taught me how to cook with the fewest ingredients. Most of these ingredients were not featured on any cooking show. We began our gluten-free, casein-free, soy-free (GFCFSF) journey. I made a lot of mistakes early on in our dietary journey. There was hidden casein in medications and hidden gluten in sunscreen. It took a while to find all the products without the offending ingredients. When mistakes were made, I felt like a failure. 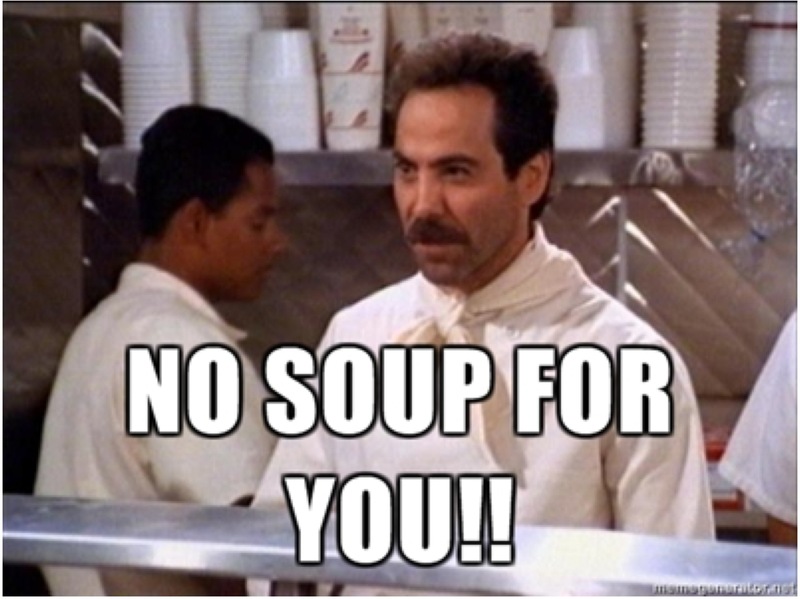 I could hear the Soup Nazi yelling at me “ NO SOUP FOR YOU!” This is this reason why TACA’s dietary section is so detailed and thorough, so families can hopefully avoid these difficulties. Going allergy- free taught me a lot of lessons. Just because something was GFCFSF didn’t mean it was good for my son. I saw a lot of families (including mine) that fed their child way too many empty carbohydrates and sugar-ladened foods which would then lead to battling huge yeast issues. For our family, the “yeastie beasties” took four years to tame (5.) Years back, we did a short trial of a dairy-free version of the Specific Carbohydrate Diet (SCD) which also helped to address the yeast issue. During the next dietary phase, we rotated probiotics every six months. We also added fermented foods like kombucha to promote good bacteria in the gut. Following these steps eliminated Jeff’s need for anti-reflux medications for good. It was nice to stop picking up that prescription and find natural alternatives. Success! Finally, there is SOUP FOR US! GFCFSF is not the only choice. There are a ton of dietary choices based on your child’s issues and needs. Back “in the ol’ days” there was only the GFCFSF diet. Then, after a few years, the SCD diet was introduced. There are least a half dozen more options today: Low oxalate, Body Ecology, GAPS, Paleo and Weston Price among many others. All the diet devotees state that only their diet works. I know many TACA families start with going gluten, casein and soy-free (GFCFSF) first. We have the tools to help (6.) Once you get started, you can always research the other dietary choices if your child is not making progress after a full 6 month trial. Now, back to the Soup Nazi. As my son’s gut and health issues have healed, he has been able to eat more typical foods. Real cakes. Real Treats. Real Foods. No one now looks at Jeff’s food like it looks different than anyone else’s. It is just healthier and allergy free. We balance everything following his supplement regimen, making sure his body takes out the trash everyday by proper elimination and regular exercise 3-4 times a week. We are now able to do typical family things. The foods Jeff eats today, I wasn’t able to offer him early on. We can now relax a little more and not be the Soup Nazi while still avoiding his allergies without suffering any consequences. I can easily tell when I see a kid with autism on the GFCFSF diet consuming healthier options. They look healthy. They stim less. They have less aggression. Some can also learn in typical classroom settings. I can also tell if a kid with autism is not going through dietary intervention. They have dark circles under their eyes, their pupils and eyes are racing. Many have erratic behaviors and aggressive outbursts. As with everything in the autism world, not every treatment helps every kid. At TACA, over 80% of the families we serve report back great improvements when removing their children’s food allergies and switching to healthier foods. What families need to know is allergy removal success has odds in your favor. It is worth the hard work. For families who have not experienced success, get with your TACA mentor or doctor to talk about other issues and possible solutions. We’ve slipped twice in the past 6 years and both times Jeff paid for it. We all remember it well. Now Jeff reads labels on his own and monitors his own allergies. Today, we eat great healthy and balanced meals. The list of no’s include: no gluten, casein, soy, dyes, and preservatives. We also eat organic and do healthy take out options . Early on I was like the Seinfeld character Soup Nazi. During the first four years of the diet that’s how you could describe me. I was tyrannical about the diet. Sadly, I criticized others for not doing it right. Today, I would love it if our very sensitive and medically fragile kids just ate REAL FOOD and avoided any FOOD ALLERGIES. Today Jeff doesn’t need the Soup Nazi mom. He eats healthy. He eats food that looks “normal” while dodging 1/2 dozen allergies and is totally happy. We feel like the cruise-control is on and life and food issues are under control. There IS soup for us and families like ours.